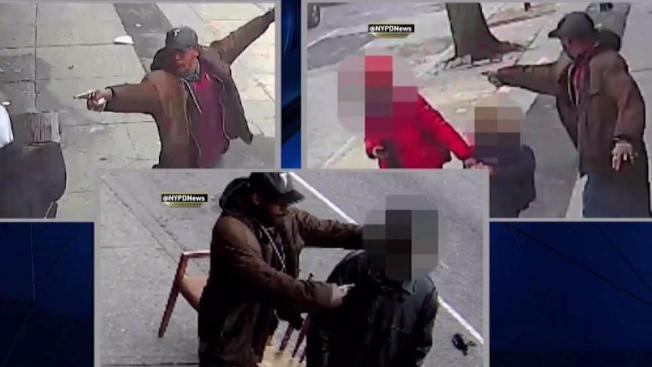 The man's parents, Eric and Lorna Vassell, say their son had bipolar disorder but describe him as a "good person"
The NYPD released surveillance video Thursday of the moments leading up to the deadly shooting of a man with a pipe in Brooklyn. Jonathan Dienst reports. 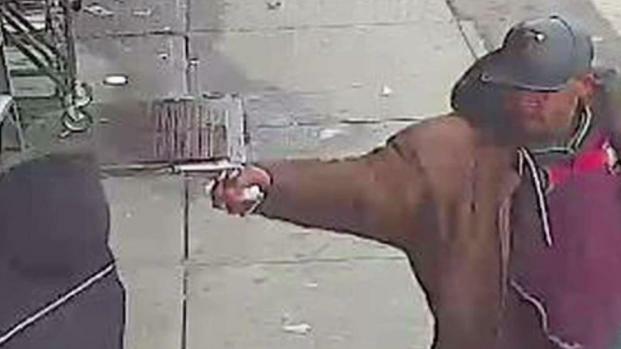 The NYPD has released surveillance video and 911 call transcripts in the deadly shooting of a 34-year-old man who pointed a metal pipe at officers responding to several 911 calls in Brooklyn Wednesday. The man, identified as Saheed Vassell, was shot and killed on a street in Crown Heights Wednesday afternoon by officers who mistook the pipe for a gun. The city medical examiners office on Thursday revealed that Vassell was struck by bullets nine times. 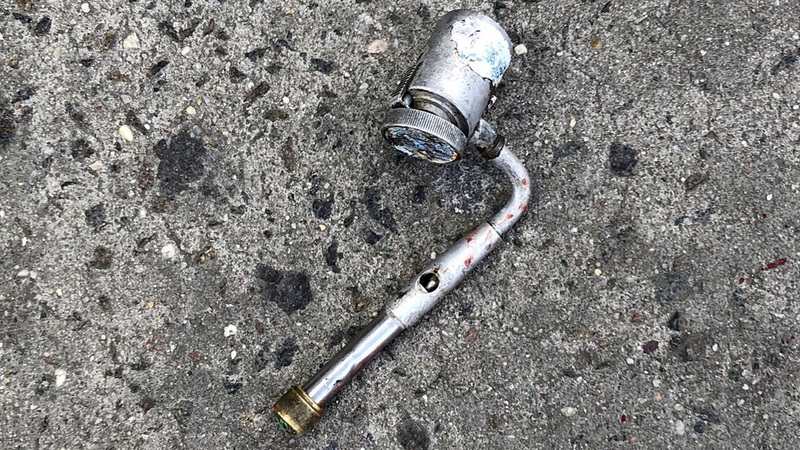 The edited 50-second video released on the NYPD's Twitter account Thursday shows Vassell lunging at and pointing a metal pipe at several passersby on the sidewalk, in one case poking it in a person's chest. In another, he points it directly at someone walking with a child. A transcript of one of the 911 calls, spliced as a text screen into the video, shows the caller telling the dispatcher: "There is a guy in a brown jacket walking around pointing -- I don't know (to someone else), what is he pointing in people's face? They say it's a gun, it's silver." The NYPD has released surveillance video of the moments leading up to the deadly shooting of a man with a pipe in Brooklyn. The department also released the 911 call transcripts. 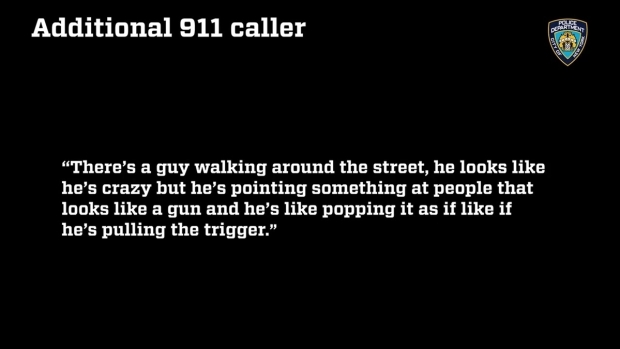 Another caller says, according to the transcript: "There's a guy walking around the street, he looks like he's crazy but he's pointing something at people that looks like a gun and he's like popping it as if like if he's pulling the trigger." The video released by the NYPD compiles a string of surveillance footage showing Vassell apparently harassing and threatening people with the pipe, in between text screens of the 911 calls, with no audio. It also shows the moment Vassell pointed the pipe at officers. The video freezes at this point, and text appears over the image, saying: "At this point, responding officers discharged their weapons." Dispatcher: He has a gun Ma'am? He has a gun? Dispatcher: Yes, he's inside your store or outside? Dispatcher: Outside of your store? Dispatcher: OK, location is a laundromat and he's outside of your store, right? Dispatcher: Where is the gun? Where is it? None of the officers were wearing body cameras at the time of the shooting. Police shot and killed a man holding a pipe in Brooklyn after callers reported a man pointing what appeared to be a gun at people. Checkey Beckford reports. NYPD officials say the cops who responded to the 911 calls thought he was about to fire on them. Chief of Department Terence Monahan said Vassell "took a two-handed shooting stance and pointed at" the four officers who encountered him at Utica Avenue and Montgomery Street. The cops fired 10 shots. Nine of those bullets hit Vassell, according to the medical examiner's office. He was hit in the head once, twice in the chest, once in the abdomen and once in each arm. His lower body was also struck by three bullets. He died from brain, aorta and spinal cord injuries. The office ruled his death a homicide, but noted that its determination was not a criminal finding. Rather, the office said the term indicates that Vassell died due to the actions of other people. After the shooting, the officers approached to administer aid, Monahan said. It was then that they discovered the man had not been holding a gun, but a pipe with a knob at the end. Vassell was pronounced dead at a hospital. "This was not an EDP (Emotionally Disturbed Person) call... this was a call of a man pointing what 911 callers felt was a gun at people on the street," Monahan said Wednesday. "When we encounter him, he turns with what appears to be a gun at the officers. We have to stay straight on the facts with this incident." On Thursday morning, the state attorney general's office said it was opening an investigation into the shooting. Mayor de Blasio said, "This is a very painful situation; it is a tragedy by any measure." Vassell was well-known in the neighborhood, according to his family. His parents Eric and Lorna Vassell tell News 4 he had bipolar disorder but was a "good person." They said they're not angry, but "hurt" that they say police didn't give him a warning to drop the pipe before opening fire. Another neighborhood resident described Vassell as a mentally ill man who sometimes talked to himself but should not have been shot. Witness Jack Hinds said the officers started firing nearly immediately. "It's almost like they did a hit," Hinds said. "They didn't say 'freeze,' they didn't say 'put your hands up,' they didn't say 'stop for a minute.' They just started shooting." After the shooting, dozens of Crown Heights residents crowded around police lines, some apparently angry. Later, residents could be heard shouting "black lives matter" and "stop killing us" at officers at the scene. But the crowd remained peaceful and dispersed later on Wednesday. The pipe a man was allegeldy holding and pointing at officers before being shot to death on Wednesday, April 4. A rally is planned for Thursday afternoon in the neighborhood as a memorial featuring "Black Lives Matter" and "Rest in Power Saheed" signs grows. Vassell's parents say their son was Jamaican and moved to the city with his family when he was 4 years old. Wednesday's shooting comes amid nationwide uproar over the fatal police shooting of an unarmed black man, Stephon Clark, in Sacramento, California. In that case, officers responding to a call about someone breaking windows shot and killed the 22-year-old Clark in his grandmother's backyard. Officers said they fired their weapons because they believed Clark was holding a gun, though he was holding only a cellphone.